Train and empower your employees and partners from day one with the right training, when and where they need it. Scale onboarding through easy-to-manage learning paths. 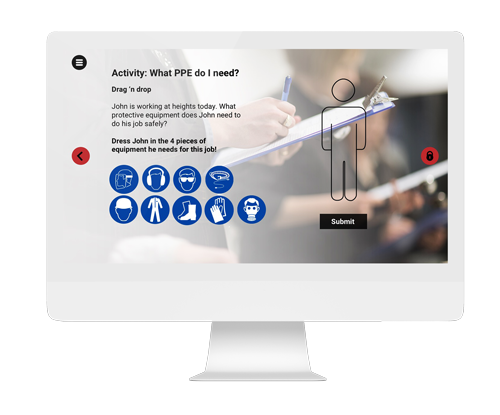 Create your own engaging elearning modules. Increase engagement through activities and quizzes. Onboard your new employees as quickly as possible by inviting them – even before they have officially started – no matter their time zone or location. Tailor content to your employees’ needs and scale as you grow. Add rich media to boost engagement. Segment audiences by groups, departments and stages. Build a business culture based on knowledge and ethics. Equip your staff with the right training and give them something that inspires them. Everyone can get up to speed at any time on any topic by accessing a single hub. With our Adapt tool, you can create content in no time! Create custom modules and categories. Drive your training ROI with actionable insights into employee performance. Tracking training progress in real time helps you identify strengths and knowledge gaps, so you can provide support when and where it's needed. Analyze scores and completion levels in real time. Benchmark performance from one visualized dashboard. Follow and map progress over time for every single employee. Adapt is an intuitive open source authoring tool for end-users and developers around the world. It supports the principles of collaborative development and transition to a community-led governance structure. The tool works across all major devices and can be deployed in Scorm-based LMSs, such as Moodle and others.